Thanks to support from the Procter & Gamble Alumni Foundation, E+O is able to provide three young women who are motivated to run a home-based business with a safe, sustainable place to work, live, and make money—and business skills training to boot. Under this pilot project, E+O partnered with our manufacturing partner in northeast India as well as our financial institution partner NEST (Northeast Social Trust), to identify three young women in three communities in the Indian states of Arunachal Pradesh and Assam. These women undergo screening by our local partners to ensure that they have the basic literacy and math skills required to run a small business, and that they are motivated to learn business skills and establish a microenterprise of their own. E+O is now in the process of providing two women with an affordable, quality house in which to live, work and make money; and NEST will be providing them with the business skills training to help make their home-based enterprise a success. (Our third recipient is still being finalized.) The structures are modular, sustainable, quality and affordable structure, and each beneficiary has customized it according to their small business needs. Although the women could not afford to buy the structures themselves, and the buildings are donated, each family is required to contribute significantly towards the cost of the foundation to ensure their motivation to participate in the program. P&G Alumni Foundation has funded the entire pilot, called the Daily Essentials Kiosk project. In recognition of their generous support, E+O is giving e each beneficiary a starter kit of P&G and Gilette India products to sell from their new home-based business. Kannawati Enling, 30, of Lathow village, Arunachal Pradesh (pictured above) lost her previous home (remains pictured at left) when it was razed in a cooking stove fire. She and her husband escaped with only their young daughter and their television and moved in with her father and younger siblings in a two-room self-built structure. 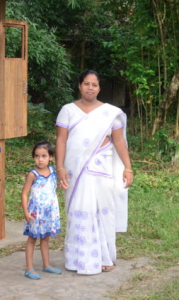 Now, the family is moving into an E+O structure on her father’s property, from which Kannawati will run a snack stall serving the nearby community. Our NEST partners’ assessment is that Kannawati “knows the demands of her customers” and that, with the appropriate bookkeeping and enterprise development skills, she should be a successful grassroots businesswoman. 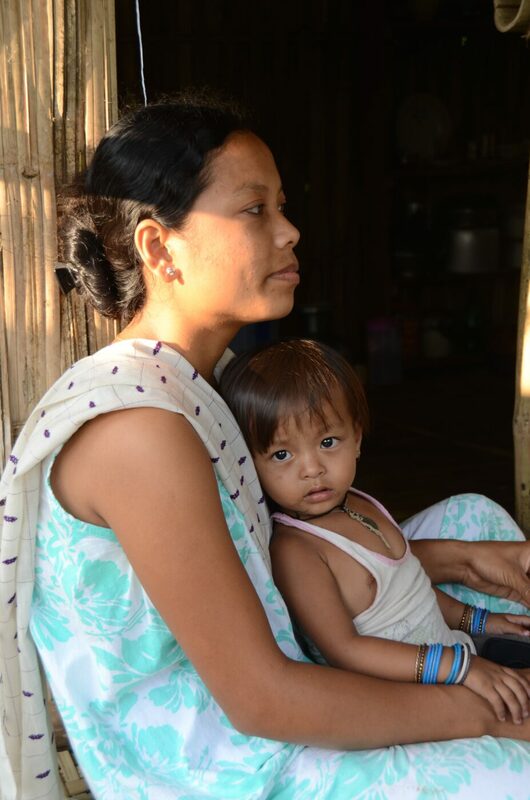 Deepali Kalita, 35, lives with her family at Dirak Gate, on the border between the states of Assam and Arunachal Pradesh. Their current business, to provide tea, snacks and grocery items to travelers on the highway, is hampered by the fact that there is limited parking permitted by border authorities. The family had acquired a piece of land 1km south, where they could provide substantial parking and run what NEST has assessed could be an extremely profitable and well-patronized business providing groceries, daily essentials and meals to travelers. Construction will be completed Thanksgiving week on their new structure. Subscribe to our newsletter below to receive updates on our “Mompreneurs’” progress in their new live/work spaces, as well as other news from E+O.